As it often happens in the IT industry, new technologies are first applied in the corporate/business sector and then their cheaper brothers get into the SOHO sphere. It also concerns network technologies. Just short time ago one of the problems facing a system administrator of a small office was whether to have a network or not, a speed didn't matter. Nowadays, because of a heavily increased multimedia traffic and a considerable fall in prices for 100Mbit equipment, many use the Fast Ethernet technology. It is widely adopted not only in offices but also in home and non-commercial networks. Moreover, if network laying is well thought out you can change only active equipment to increase the speed, while cables can remain the same. Of course, 100Mbit/sec is much better than 10, but one always wants something more efficient. The Copper Gigabit technology provides 1 Gbit/sec in a usual copper cable (5E category). These figures are ideal. In reality, it can take around 40 min. to transfer a 700 MBytes movie over the 10Mbit network. Besides, if someone else is doing the same the time gets even more. Figures become more realistic when we measure a speed of reading of a file from a system disc: 900 KBytes/sec for a 10Mbit network and up to 9000 KBytes/sec for a 100Mbit one. For the 1 Gbit adapter 128 MBytes/sec is a too overstated result as the process can be limited by a PCI bus (the junior version is PCI32/33 MHz = 133 MBytes/sec, though there is also PCI64/66 MHz = 533 MBytes/sec) and by a server's disc subsystem. For example, the Ultra160 SCSI has a peak transfer rate of 160 MBytes/sec, but in reality you can get 40 MBytes/sec from one disc and up to 120 MBytes/sec from a RAID0 array of 4 discs (and this is not on the PCI32/33 MHz :). Unfortunately, different network generations differ 10 times, unlike, for example, processors and videocards. It is impossible to get first 20Mbit, then 50 and so forth. But if we take into account the back compatibility of the Copper Gigabit adapters with wiring of the 5th category and 10/100BaseTX equipment, such adapters can easily integrate into the current networks. It should be noted that although it is required to use 5E wiring, the tested adapters worked in a 1 Gbit mode with a cable of a usual 5th category which was 10m long (the cable had all 8 conductors separated, not only 4 ones as required for 10/100BaseTX), though the maximum distance can be limited in these conditions. 1 Gbit adapters keep on spreading out because their prices are falling down as they use highly integrated chips produced for this technology. But major manufacturers include into the price not only the cost of the hardware but also their software programs and support, that is why server versions of the cards remain expensive. At present, a lot of network equipment makers have already released their desktop versions of 1 Gbit network cards. They are often just light versions of server adapters, but the price is also much lower. The high speed operation is maintained, though some server functions are not supported. 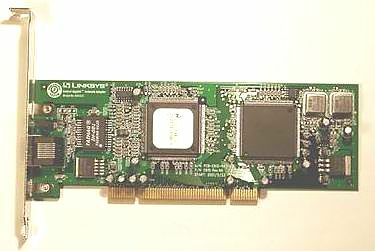 After server adapters based on the 82543 chips Intel released a one-chip solution on the 82544. Unfortunately, the information concerning Unix is controversial. Besides, some sources indicate that the Desktop version has drivers only for Windows and DOS, but the Intel's site offers Linux drivers as well. The software comes on a CD-ROM, but there is a program supplied which can create diskettes with drivers for required operating systems. Thus, you can check up a status of the adapter, carry out its diagnostics and adjust VLAN. Cards are often produced in pairs - one for a PCI32/33 MHz bus and the other for a PCI64/66 MHz one (for example, Linksys EG1032 and EG1064). Undoubtedly, adapters for a high-speed PCI bus can be installed on a usual one. The most of such cards have a driver support for the whole Microsoft Windows family (95, 98, NT, ME, 2000), and for Nowell Netware 4.2 and 5.0. Sometimes, instead of the Netware we get drivers for Linux (DLink), or sometimes both are supported (TRENDware). By the way, asthe speed is high (1 Gbit/sec) the chips are sometimes covered with heatsinks (TEG-PCITX). In our tests we used two 1 Gbit adapters - Intel PRO/1000 T Desktop and Linksys Instant Gigabit EG1032. Their installation was flawless, the drivers were set up easily, no rebooting was needed (thanks to the Windows 2000 :). To estimate a network performance we can install a server part of the software on one PC (for example, an FTP server or just a folder with a general access) and then measure an operation speed of it with clients (i.e. in our case it is a speed of reading data from the FTP server or the folder). But the most interesting is to test a configuration like "one server - several clients". In this case to estimate a performance it is necessary to automatize the process. The first tests are not high-accuracy and they are primarily aimed at finding out differences between 100 and 1000 Mbit adapters and at defining the maximum data rate on the network. Besides, the tests do not compare two 1 Gbit adapters as the speeds are very close, and the results are not highly precise. First I just connected two PCs with the 100Mbit adapters with a cross-cable. Then I measured a data rate which was around 9000 KBytes/sec (it is very close to a theoretical limit of 12.5 MBytes/sec). After that I connected the same way 1 Gbit cards Intel PRO/1000 T Desktop and Linksys Instant Gigabit EG1032. The adapters' LEDs showed a 1 Gbit connection. But the speed measured was only 24,000 KBytes/sec. It is of course far from the theoretical value of 128, but it is also much better than 9 of 100Mbit adapters. There was something wrong with it, and I installed the RamDiskNT program (for creation of a virtual disc in the PC memory) and the speed of reading from this disc was 43,000 KBytes/sec! The next test was aimed at estimation of a speed of simultaneous access by several clients to the server. To connect the 1 Gbit adapters I used a commutator from Linksys - EG0801W which had 8 ports for 10/100 Mbit and 1 port for 1000 Mbit. Three client PCs were simultaneously reading large files from the network disc. Unfortunately, we couldn't start the RamDiskNT here as it was necessary to increase its size at least to 256 MBytes to get adequate results, but the memory resource on the server didn't allow it. For the 100 Mbit network the total data rate was 12 MBytes/sec, and when we used a 1000 Mbit adapter the speed was 21 MBytes/sec. The tests show that one, even inexpensive, 1 Gbit adapter on the network server combined with a simple commutator with one high-speed port can much improve operation of clients. The speed grows up if it's not limited by, for example, a hard drive or a processor. To get more precise figures I used the NetBench 6.0 program of the Ziff Davis Media Inc Test Set. It automatizes a testing process for several clients. The patterns included into the program are developed for 60 clients, but their number can be increased up to 1000. The program consists of two parts: test controller's software and client software. Keep in mind that there is no any special server part and the test can check any device which can work as a file server (e.g. NAS Snap Server). For this test I do not recommend to combine a controller and a client in one PC. For the test we used 6 PCs. The server was based on the AMD Athlon 1200 with Seagate Cheetah 36ES drive. There were 4 client PCs of different configurations :) (from Celeron 733 to Pentium 4), and as a controller we got an old Intel Pentium MMX 200 under the Windows 98SE. 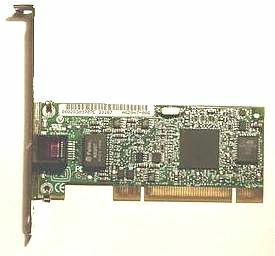 The network cards in the clients are based on the Realtek 8139 chip with standard drivers of Windows 2000. 1000 Mbit adapters from Intel and Linksys were installed into the servers. The speed can actually be increased if we adjust the adapters additionally (for example, using the Jubmo frames), but it is often necessary to have a special commutator which supports the required technologies. Thanks to a low price I can recommend to install these adapters into new PCs provided that you use this technology and you really need such a speed at each workplace. You can also use them to join two PCs into a high-speed network. Bear in mind that a data rate on the Gigabit Ethernet in our tests was limited by a hard drive (not by a network). Besides, the adapters can be used in small office networks with a pronounced file server.